The Mint of Hungary has issued (September 5) the latest coin in its ongoing series, “Castles in Hungary.” The new issue features the 14th-century castle of Szigetvár, located in Baranya county in southwestern Hungary, just 30 kilometers from the present Croatian border. 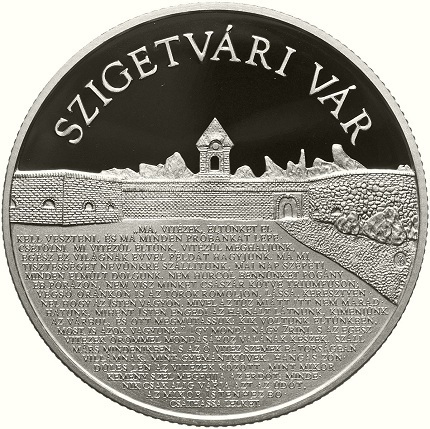 The coin is issued on the 450th anniversary of the seige of Szigetvár Castle in 1566. An important event in Hungarian history, this conflict saw Croatian viceroy, Miklós Zrínyi (1508 – 1566), commander of the castle at the time, repel the army of Sultan Suleiman, which consisted of between 100,000 to 120,000 soldiers on their way to attack Vienna. Zrínyi was defending the castle with his army of just 2,500 soldiers, and was eventually forced to give up the outer fortress after the unceasing siege. He and his army withdrew to the inner castle’s protection with just 200 soldiers remaining. As fate would have it, Sultan Suleiman died on September 5, a development neither the besieging army nor the defenders of the castle were aware of. Just two days later, Viceroy Zrínyi ordered his remaining soldiers to storm out of the castle since they could no longer hold down the defense of the burning courtyard of the inner castle. Wholly out-numbered, with the certainty of death looming over their heads, they fought with distinction only to be captured and slaughtered by the Ottoman invaders, with only seven soldiers escaping death. With the fall of the castle, the flag of the victorious conquerors was raised above the town, where it stayed for the next 122 years. This period left the surrounding areas with numerous Ottoman architectural relics. One of these was found in the castle yard — the Suleiman djami, or house of worship, with the ruined minaret, along with a mirhab or prayer niche facing Mecca, with fragments of Arabic-Persian writing on the walls. Memorial celebrations have been held in Szigetvár since 1833 to pay homage to the heroism of Miklós Zrínyi and his soldiers. Today, the castle serves as a public park, with additions and memorials being erected in memory of those who played an important role in the castle’s development over the years. In 1966, a drinking fountain was added and the Turkish-Hungarian Friendship Park was inaugurated in 1994 on the 500th anniversary of Sultan Suleiman’s birth. In 1997, a statue of Miklós Zrínyi was added to the castle’s courtyard; in this way, after four centuries, the two commanders look toward the Szigetvár castle grounds together. The coins, designed by Borbála Szanyi, are identical in their motif but different in their denomination and composition. 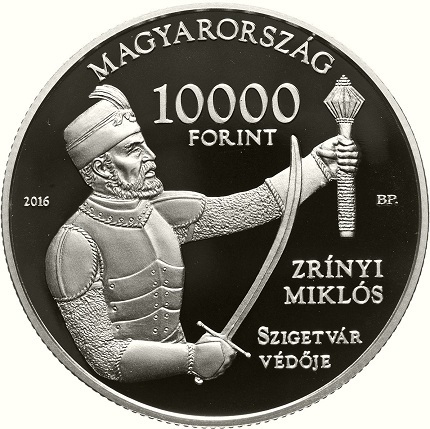 The obverse depicts the profile figure of Miklós Zrínyi in armor, defending the castle and wearing a hat, with a sword in the right hand and a mace in the left. The reverse includes the text SZIGETVÁRI VÁR (SZIGETVÁR CASTLE), which is placed above the primary design, while the main motif represents the current southern view of the castle. There is a quote in the foreground from the epic, Peril of Sziget, written by the Viceroy’s great-grandson, Miklós Zrínyi (1620-1664), a poet and military leader. This is the seventh coin in the popular “Castles of Hungary” series. This design is issued in both precious metal as a Proof quality silver coin and as a BU quality cupro-nickel base metal coin. For more information on this and other coins offered by the Hungarian Mint, please visit their Web site. International orders will be dispatched where applicable.